1oz pineapple juice, Shake over ice and strain into a chilled martini glass, garnish with wedge of lime. Key West mileage to other Florida areas WEIRD-SHOTSä Not Just a Seasonal Thang! 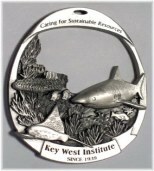 "Key West Register Reader's Comments"
Key West Institute Commemorative Medallion "Caring for Sustainable Resources"
Description: head and fins covered with small black spots; irregular dark and vertical bars present on the sides of body; pectoral and caudal fins rounded; first dorsal fin shorter than and not separated from second dorsal; adults huge, up to 800 pounds; eyes small. Where found: NEARSHORE often around docks, in deep holes, and on ledges; young often occur in estuaries, especially around oyster bars; more abundant in southern Florida than in northern waters. "See you in Key West!" Barracuda can grow very large, perhaps up to 6 ft. and 106 lbs. They are not dangerous fish as thought by many. They look very fierce with a large tooth showing outside their lips but any attack is extremely rare. They feed on other smaller fish; they usually they circle their victim first before attacking. 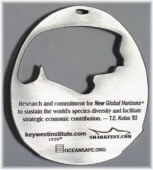 Commonly caught near reefs when trolling, and often seen by reef snorkelers. The flesh of large specimens can be toxic with ciguatera. 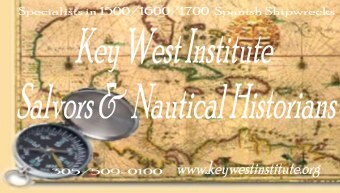 Market analysis from "The Financial Haven Key West, Florida"
Samuel Plimsoll, M.P. 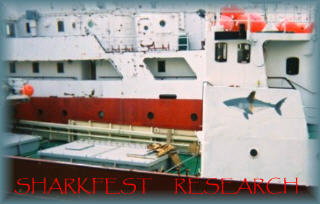 the PLIMSOLL MARK saving lives and reefs. Samuel Plimsoll brought about one of the greatest shipping revolutions ever known by shocking the British nation into making reforms which have saved the lives of countless seamen. By the mid-1800's, the overloading of English ships had become a national problem. Plimsoll took up as a crusade the plan of James Hall to require that vessels bear a load line marking indicating when they were overloaded, hence ensuring the safety of crew and cargo. His violent speeches aroused the House of Commons; his book, Our Seamen, shocked the people at large into clamorous indignation. His book also earned him the hatred of many shipowners who set in train a series of legal battles against Plimsoll. Through this adversity and personal loss, Plimsoll clung doggedly to his facts. He fought to the point of utter exhaustion until finally, in 1876, Parliament was forced to pass the Unseaworthy Ships Bill into law, requiring that vessels bear the load line freeboard marking. It was soon known as the "Plimsoll Mark" and was eventually adopted by all maritime nations of the world. He is not a clever man, he is a poor speaker and a feeble writer, but he has a big good heart, and with the untutored utterings of that he has stirred even the most indifferent. He has taken up a cause, not a popular cause nor a powerful one -- only the cause of the British sailor who is sent to sea in rotten vessels in order that ship-owners may thrive. He has written a book about it -- a book jumbled together in the fashion of an insane farrago, written without method and without art, but powerful and eloquent beyond any work that has appeared for years because it is the simple honest cry of a simple honest man. Also a man who is bold enough to tell what he believes to be the truth, and it is still pleasing to many people in these Islands to find that in any accessible form. He has his reward. Any number of actions for libel have been commenced against him, he has been forced to apologize in the House of Commons, and were it not that he has found strong and passionate support among the public, he would be a lost man. His crime indeed is great. He has declared that there are men among the Merchants of England who prefer their own profits to the lives of their servants, and who habitually sacrifice their men to their money. He has moreover averred that the labouring classes are the more part a brave, high-souled, generous race who merit better treatment than to have their highest qualities made the instruments of their destruction. He tells of men who go to certain death rather than have their courage impugned, of men who freely share their meager crust with companions in poverty, and he claims sympathy and admiration for them although it is well-known that they are ill-washed, uncouth and rude of speech. Manifestly such a proceeding could only be the offspring of a distempered brain, and so it has gone forth that the sailors' champion is "mad on this question." Moreover he is very fond of his wife, and continually mentions her as having assisted in his work, which is another proof of madness. Whereupon it is clear that no great attention need be paid to Plimsoll. He has secured the inquiry he asked for however, and in due course of time we shall learn from it that there never was a country where the humble capitalist was so enslaved by the arrogant labourer as this, nor a trade in which the labourer's arrogance was so strongly marked as in that which has to do with ships. 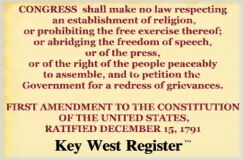 keywestregister.com - Key West Register are Trademarks of Key West Institute Corp.